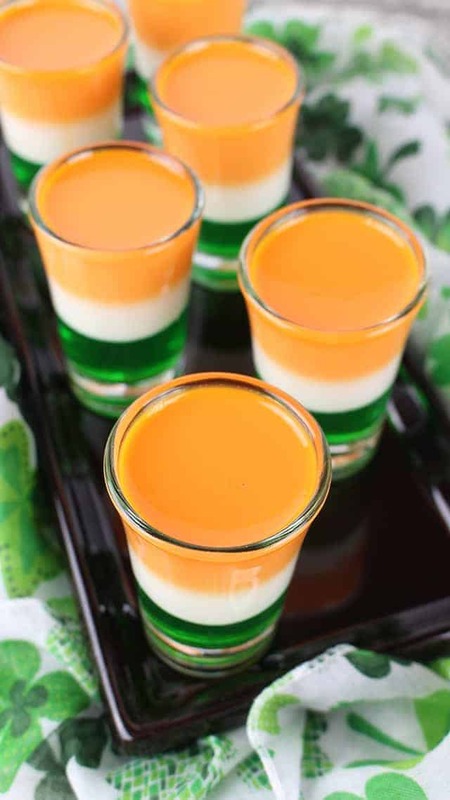 These St. Patrick’s Day jello shots are a fun way to kick off the night of celebration! There’s lime (or green apple) jello, sweetened condensed milk, and plenty of vanilla vodka in them. 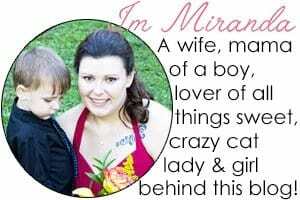 Make them a day or two ahead of time and just pull them out for the party! 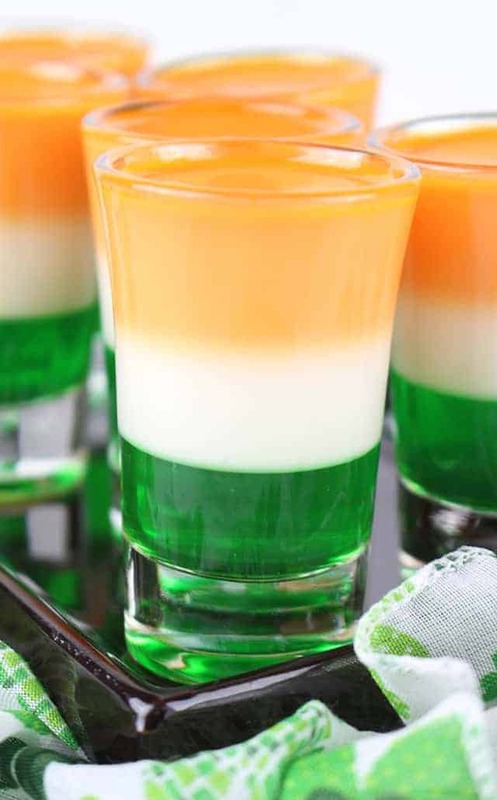 I almost called these an Irish flag shot, but then I realized that that’s a whole different animal which I definitely want to try now. I have a feeling it would be tricky to get the layers right because it’s literally just layers of different types of alcohol. I don’t think I could afford to have more than 2 mistakes happen though. I have no tolerance to booze and I can’t see myself jusr dumping it down the sink. I could probably test it out on a night where I have people around that could toss them down the hatch if the shots are fails. 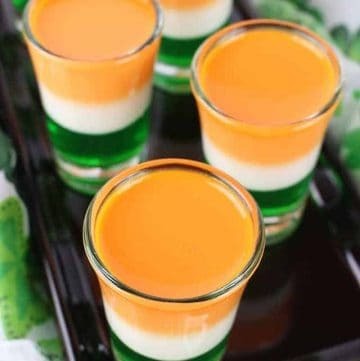 These shots can be made in different glasses. I used these 2-ounce heavy base shot glass set, but I know a lot of people would rather use plastic cups. If that’s you, these 2-ounce plastic cups might be something you want to look into. It depends on if they’re regular jello shots or these fun layered shots. Regular jello shots can be as quick as 10 minutes. The prep time for these layered shots is about 25 to 30 minutes and then you have to set for them to set up which is 2 to 4 hours. How long does it take for jello shots to set? These St. Patrick’s Day jello shots took about 2 hours to set up. Jello shots in general can take anywhere from 2 to 4 hours to set up. Jello shots can be stored in the fridge for 7 to 10 days as long as they’re in a container with a lid. 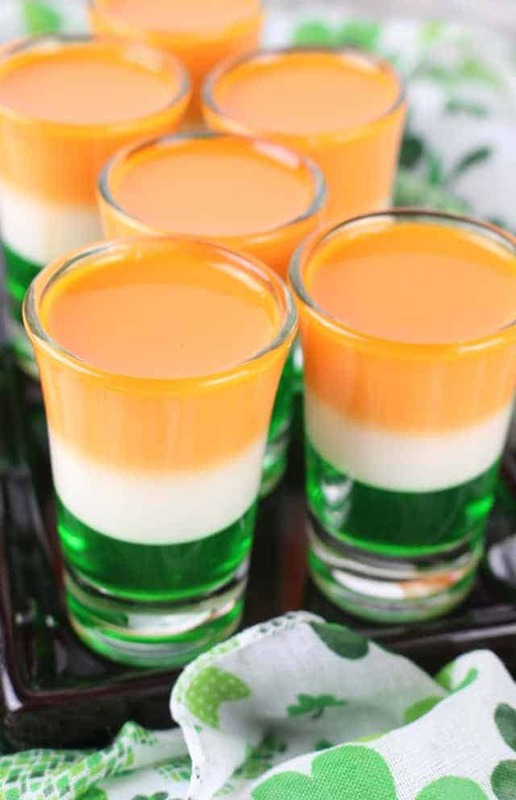 These St. Patrick's Day jello shots are the perfect way to kick off the St. Patrick's Day party! They're made with lime (or apple) jello, condensed milk, and vanilla vodka in them! In a small saucepan, add 1 cup of water. Let it come up to a boil and then remove from heat. Add 1 packet of unflavored gelatin to the boiling water. Whisk until the gelatin is completely dissolved. Add the green jello mix into the saucepan and whisk until dissolved. Add 1/3 cup chilled vodka and stir well. 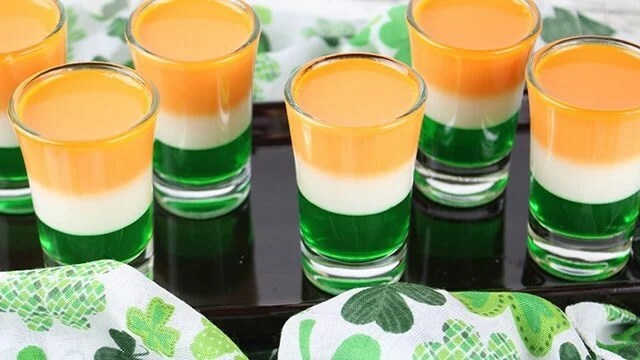 Pour the green mixture into the bottom third of each shot glass. Chill for 1 hour or until the gelatin has "set." Wash the small saucean out for the second layer. Bring 1 cup water up to a boil in a small saucepan. Remove from heat. Add the 2 remaining packets of unflavored gelatin into the boiling water. Stir vigorously until dissolved. Add in the sweetened condensed milk and 2/3 cup of chilled vodka. Mix will to incorporate. Pour half of the white gelatin mixture into a microwave safe bowl, cover and chill for later use. For the second layer, pour the remaining white gelatin mixture into each shot glass, filling it 2/3 of the way. Refrigerate for 30 minutes to allow the gelatin to "set." When the second layer is set, remove the remaining white gelatin from the refrigerator. It will be set like jello, so you will need to microwave and stir it in 20 second increments until completely melted and smooth. Add 2-3 drops of orange food coloring and stir until the food color is thoroughly incorporated. Pour the orange gelatin on top of second layer, filling up to the top of each glass. Chill for 30 minutes. Garnish with whipped cream and sprinkles. This is totally optional. I love the shots without out.